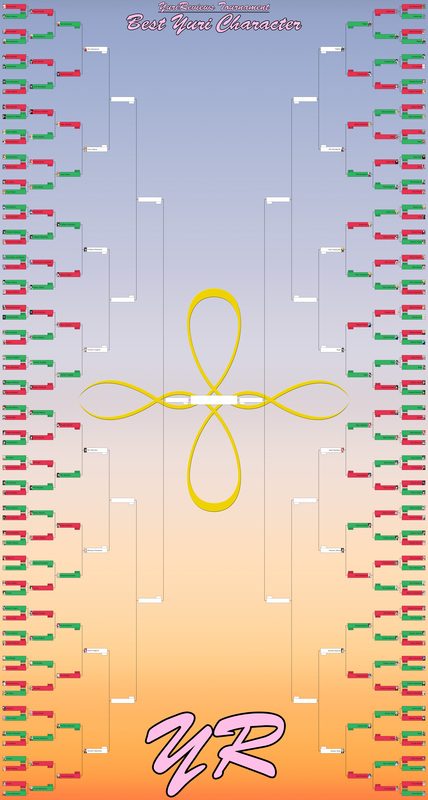 Posted on June 18, 2015 by Lena K.
The updated bracket can be found right here. This entry was posted in Tournament, Yuri by Lena K.. Bookmark the permalink. That Maki vs Homura showdown is finally here!!! No way Akko lose. I'm out girls, good luck! -Whatever happens, Sakura Trick is one of the new big dogs in the yuriverse. 2 going strong in top 16? -I would never have thought Kancolle would be neck and neck with Sakura Trick and beat out Akuma no Riddle. -Wait, Chikane and Shizuma are on the same side of the bracket? Not cool beans to have a semifinal virtual final tourney manager. Get better seeding! Everyone was randomly placed in the bracket. I'm talking about their location in the bracket. If they had an SO, they went against them in the first round (except for the Round 0 winners). If not, they were randomly paired with another solo character. I randomly chose one of the 128 slots in the bracket, assigned a random character to said slot, added in that character's SO to the neighboring slot, then repeated that process until it was full. That's totally RockTheVogt's doing, I didn't know it would end up looking like this. Aww, there are still a lot of great ones left. In case of Alice and Reimu, I was honestly surprised to see them getting so far. I think it's him that needs to watch out. You don't mess with Rock 'n Roll! If you mess with Rock, you're going to have to deal with Roll as well and vice versa. They're surely going to have each other's back. I understand you, and went Reimu. God …. that nearly Yuzu won by 0.04%. ….. My God. – Mio did beat Kyoko ???? How is possible ??? – I really supported Reimu. – Haruka vs Ayano … Mmmmmmmm …. This is increasingly fought and difficult. I can already see the doubt Chikane vs Yuzu and who could be the win. Oh this has been so much fun!, even if most of my favorites have been eliminated, especially Kyouko. I guess there's still Inugami, Kotone, and Kaga to look forward to. Where's the vote button for Lena K.? that's why her avatar picture is the center of the image right? woo Homura-sama is winning matches by a lot, after so many sad ongoings on this battle to the death, i still have hope Homura-sama shall take her righteous throne! It might not end up the way you want it to. Might be true, but we still can't deny that characters like Maki are quite popular in our community lately. I'm not sure who would win. Fate vs kaga & ayano vs haruka?! You monsters.